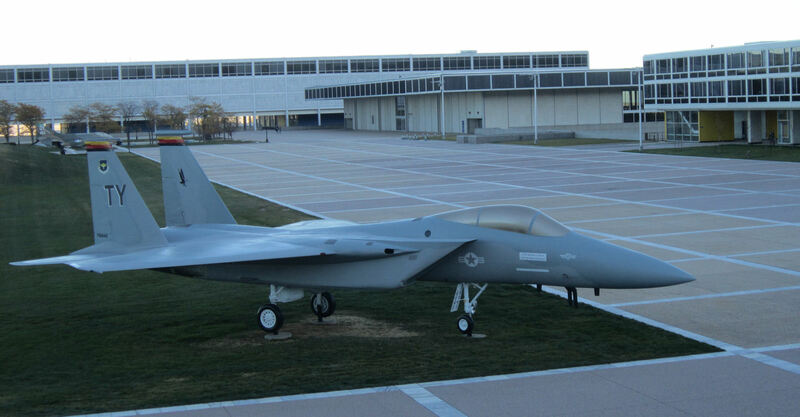 The Springs in Fall — 2015 Photos #16: The Air Force Academy Is… « Midlife Crisis Crossover! 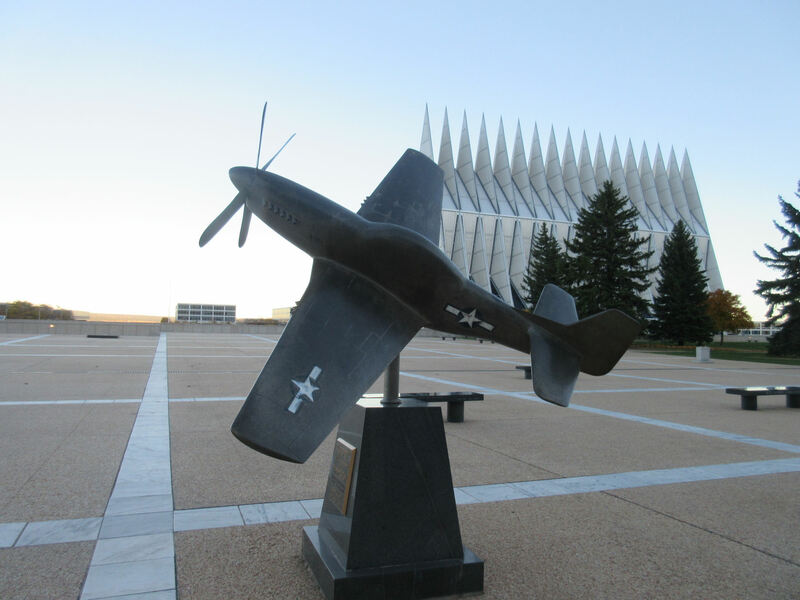 A tiny Thunderbolt is one of several statues on display in the Honor Court next to the Cadet Chapel. 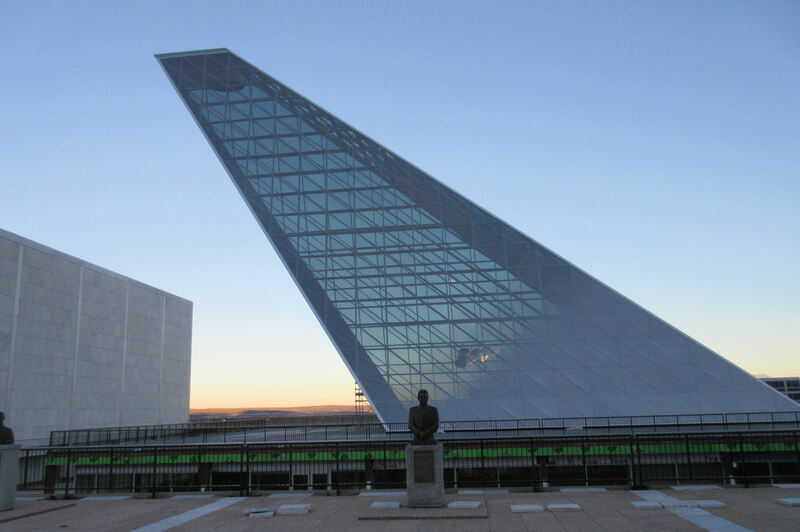 While the distinctive Cadet Chapel is one of the most impressive architectural features of the U.S. Air Force Academy, it’s not the only sight to see. 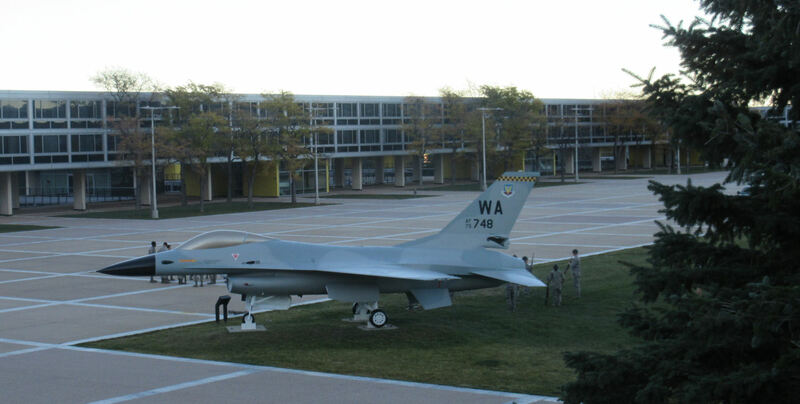 Visitor access is limited to select areas within their 18,500-acre campus, but in all honesty, the fact that we civilians are allowed within a thousand yards of the place is generous in itself. 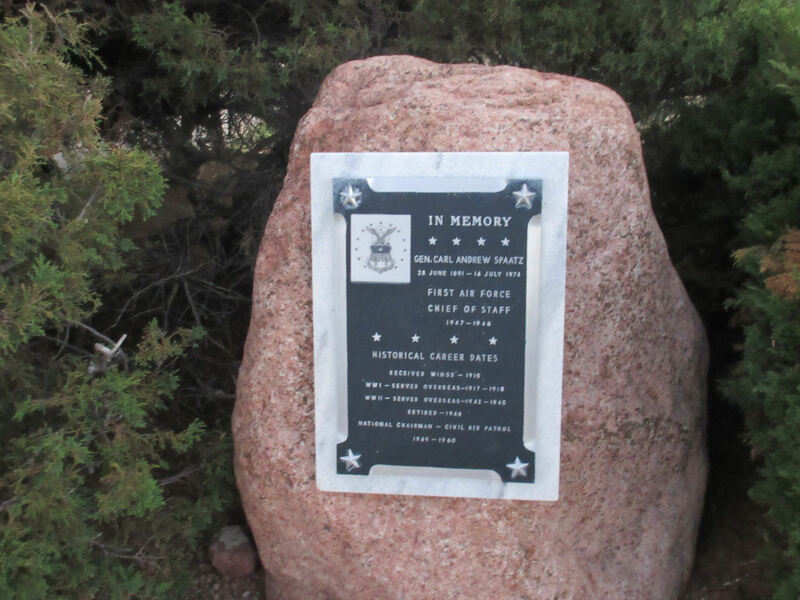 Each year my wife and I take a road trip to a different part of the United States and see what sorts of historical landmarks, natural wonders, man-made oddities, unexplored restaurants, and cautionary tales await us. From November 1-6, 2015, we racked up a number of personal firsts. 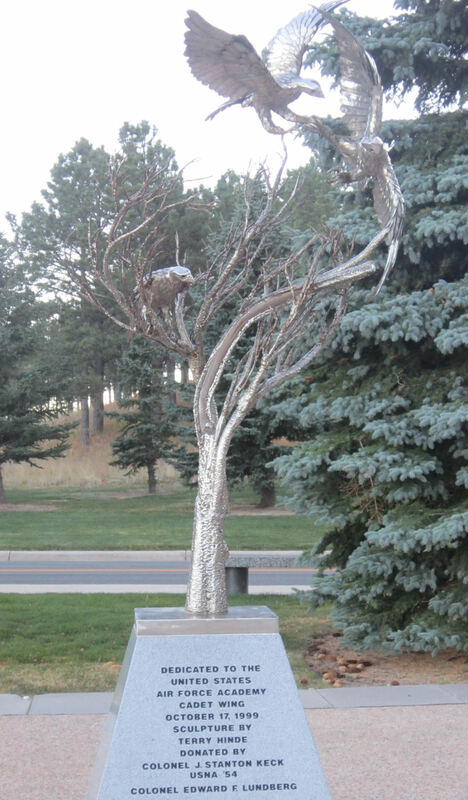 My wife Anne was invited on her first business trip to Colorado Springs, all expenses paid from flight to food to lodging to rental car, to assist with cross-training at a distant affiliate. Her supervisor gave me permission to attend as her personal travel companion as long as I bought my own plane ticket and food. I posted one photo for each of the six days while we were on location. With this series, we delve into selections from the 500+ other photos we took along the way. The view from Northgate Boulevard shortly before nightfall, with football in progress. 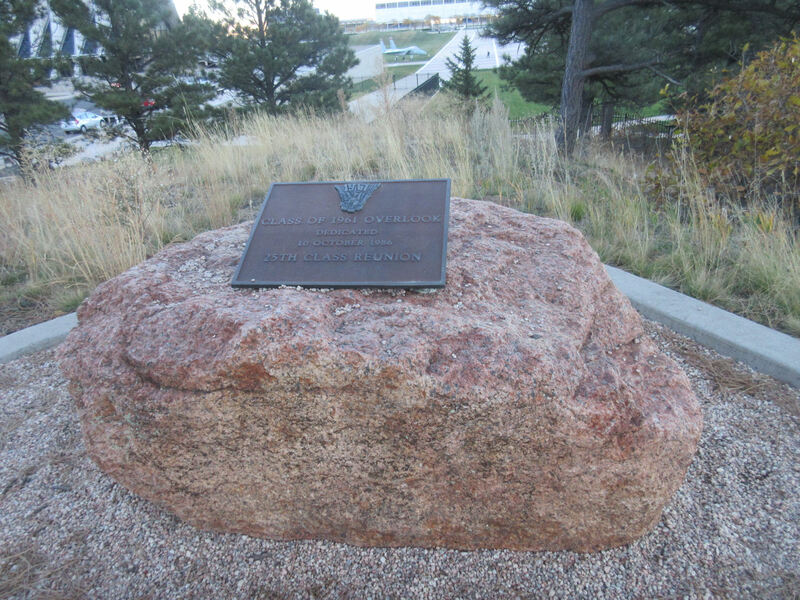 General admission is permitted off I-25 on the north end of campus, where a few items of note stand by the roadside near overlooks. Security protocols include inspecting your ID and trunk at the first checkpoint. Past that the sights begin at various overlooks that you’ll reach one by one while absolutely not speeding. 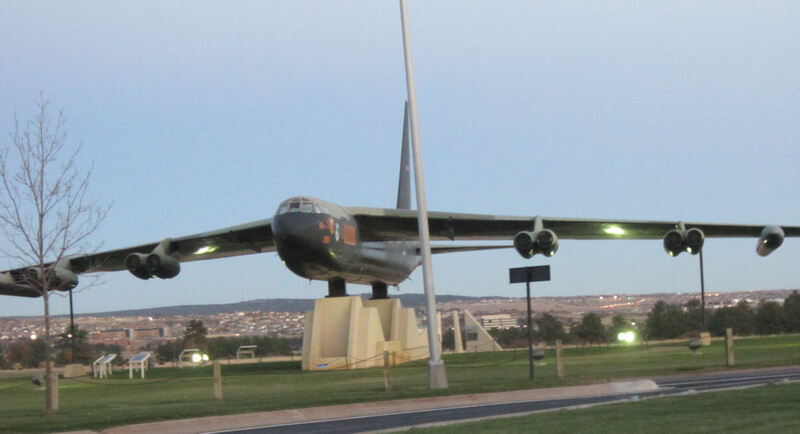 A B-52, about to set sail. A nod to General Carl Andrew Spaatz, who served in WWII and became the first Air Force Chief of Staff in 1947. Visitors begin their self-guided walkabout at the Barry Goldwater Air Force Academy Visitor Center. Anne and I arrived barely an hour before closing time, but the staff was no less courteous to us. Inside is a combination of Air Force gift shop and mini-museum with exhibits telling the Academy’s story. 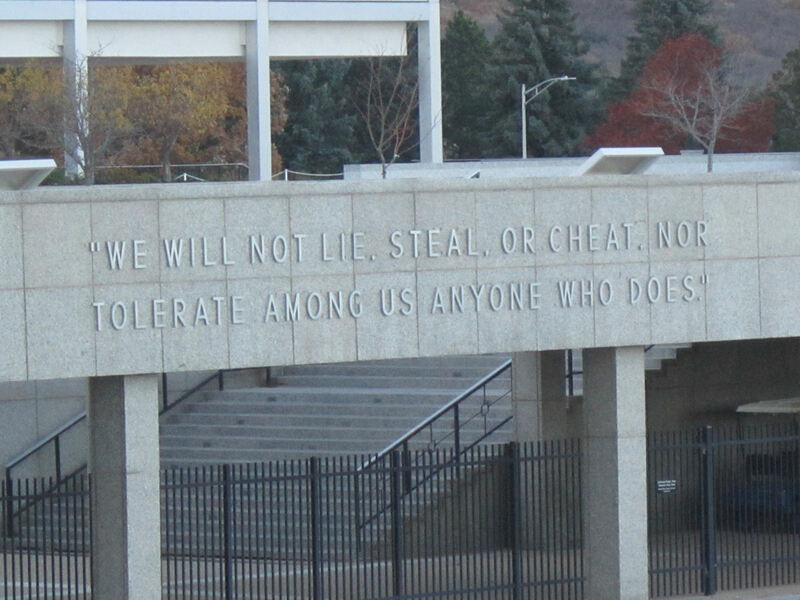 There’s also a theater with an introductory video, but our time was too short to include it. I blame my wife’s mostly benevolent employers. 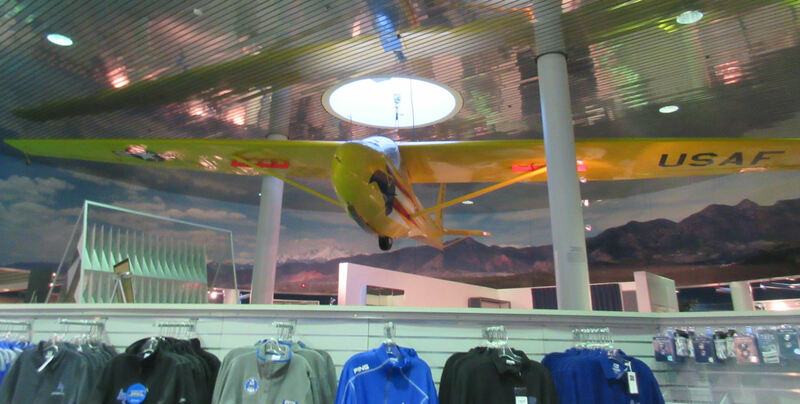 This shop’s got all you could want here — scale models of planes, a replica of the Cadet Chapel, and convenient cold-weather clothing, among other Air Force merchandise. Legislation was passed in 1954 to create an academy separate from the existing Military and Navel Academies. Its first students began classes in Denver in 1955, but its permanent Colorado Springs home wasn’t opened until 1958. Today over 4000 students attend in hopes of serving their country through this wing of the U.S. Armed Forces. According to stats posted on one wall, typical cadet tend to have been strong performers among their high school classmates. Among their makeup, 52% of the student body were in the top ten percent of their graduating class; 64% were in the National Honor Society; 80% won athletic letters; 11% were valedictorian or salutatorian. 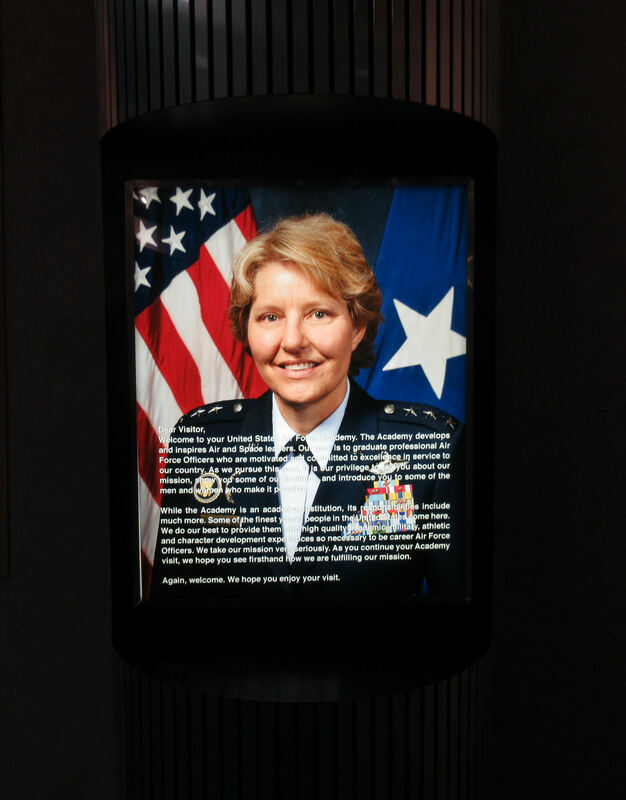 A word of welcome to guests from the USAFA’s current superintendent, Lt. Gen. Michelle D. Johnson, Class of 1981. A short hiking path connects the Visitor Center to the vaunted, vaulted Cadet Chapel. Along the way are a number of trees, some places to sit, and a few mementos of times past. Their block-shaped classrooms and living spaces obscure some of the faraway off-limits sections to the south, but the foliage is nice. 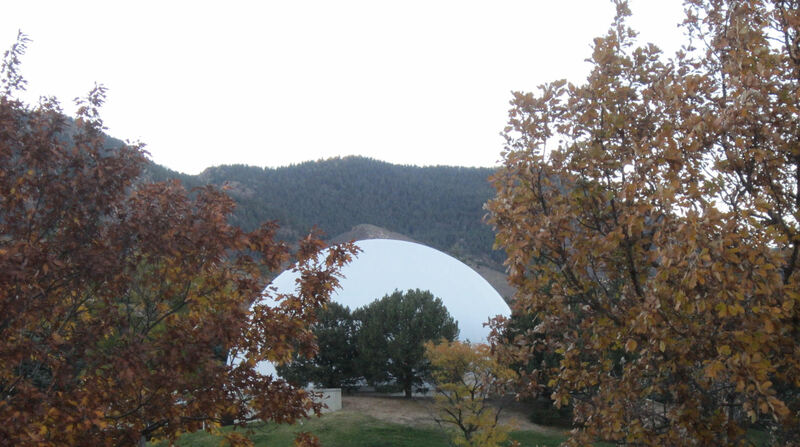 I think this is either their observatory or a pretty awesome classified experiment. To the east of the Cadet Chapel, cadets were drilling or at various sports team practices on a large field. One genuine airplane is parked at each corner of this prohibited area. Other buildings offer varying degrees of visitor accommodation, but we weren’t in the mood to rush through them, or stumble through the wrong doors, or get lost and caught on site after closing time. To us it was enough simply to wander the Honor Court and marvel at some of the modernist architecture. We have a relative who loves that sort of thing. The Center for Character and Leadership Development focuses on equipping soldiers who hold potential for future command positions. A couple of sections were roped off, but sort of waved at us from a distance. 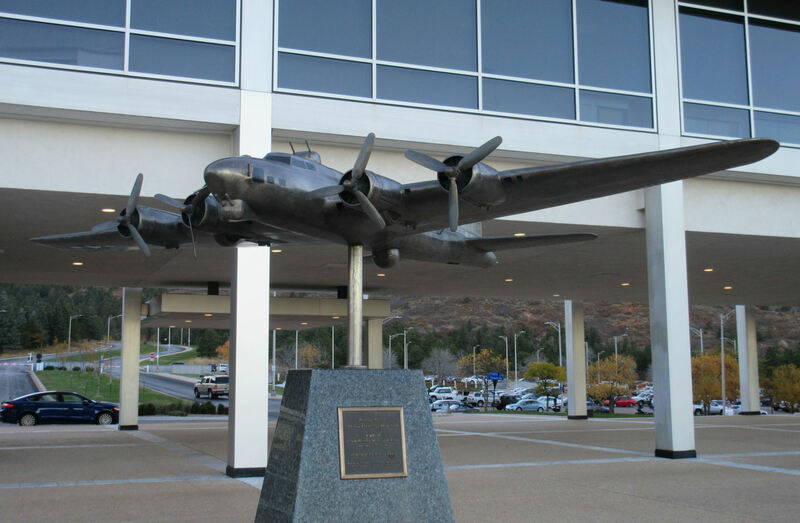 Several surrounding statues commemorate the aircraft of various decades, the symbols closely associated with the Air Force, and other aviation pioneers worthy of standing alongside the later generations indebted to their contributions. A tiny B17G Flying Fortress. Falcons are the Academy’s official mascot and sport-team names, as chosen by the first graduating class. Falconry is also part of the curriculum. Not the first reminder of Alabama on this trip. 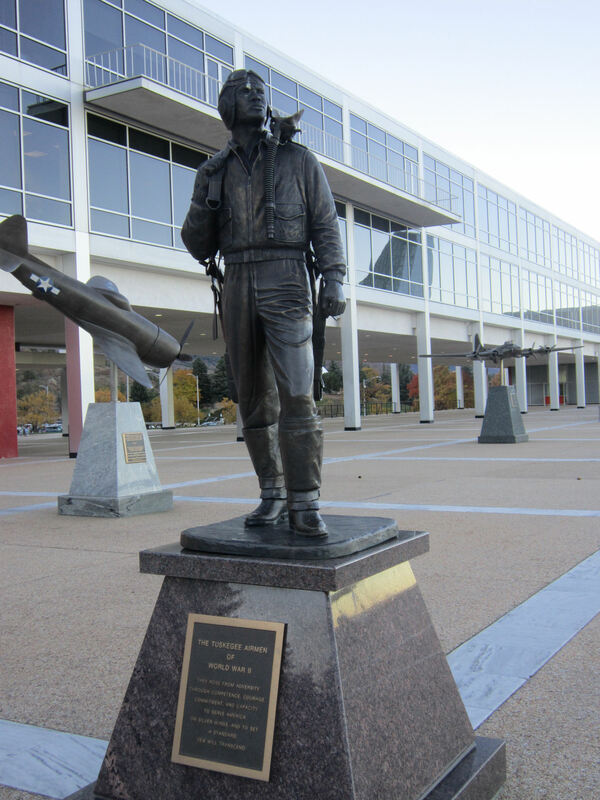 The Tuskegee Airmen predated the Academy, but, like the Air Force and its academy, their service to their country meant much to many and made a lot of things possible. At 4:45 a sort of volume-11 trumpet fanfare was broadcast across campus, acting as the orchestral exit-cue for any lingering civilians. Following that came the National Anthem, reverberating off the Rocky Mountains and echoing all around us for long moments after. We took the hint but appreciated the opportunity. Strange but true! The Visitor Center even had a display case with a small falconry exhibit. I took a photo, but it looked kind of plain. Might add it to the outtakes at the end of the series.